Can you believe this is the penultimate recipe in my Vegan Month of Food series? What a crazy ride it’s been – and here I was thinking I’d spend most of this month at home cooking up devilishly decadent chocolate recipes, applying for dozens of jobs whilst despairing of ever hearing back from them, and otherwise spending much time in my pyjamas, lying in a star-shape on the floor and staring at the ceiling. September was quite the opposite. There was a lot of recipe-testing, yes (and thankfully most recipes turned out right the first time around) – but there was also a last-minute trip to Ireland, the publication of my e-books (!!! ), fun nights out with friends, a goodbye party for a friend’s move to London, interning at a very cool publisher in Glasgow, and the best of all – I got a job. They say that patience is key; ‘it always gets better eventually‘. I’m usually the one counselling others through tough times with that phrase. And I do firmly believe in the power of positive thinking. But I’d be a chocolate-cake-munching liar if I said that the months of job hunting, trying to market myself as the ideal candidate for every graduate and entry-level job in Scotland, followed only by silence or at best a template rejection letter, hadn’t gradually withered any hope I had of being employed soon. But then it happened. An interview. A chance. A job. 1. Pre-heat the oven to 180ºC (350ºF). Line or grease 9 muffin tins. 2. Pour the oat milk and apple cider vinegar/lime juice in a cup and set aside. After a few minutes the milk will start to curdle. 3. Sift the flour, cocoa powder and baking powder into a large mixing bowl, then add the sugar and shredded coconut. Fold in the melted coconut oil and curdled oat milk until just combined. 4. Drop a generous tablespoonful of batter into each muffin tin; there should be just enough to fill them all. 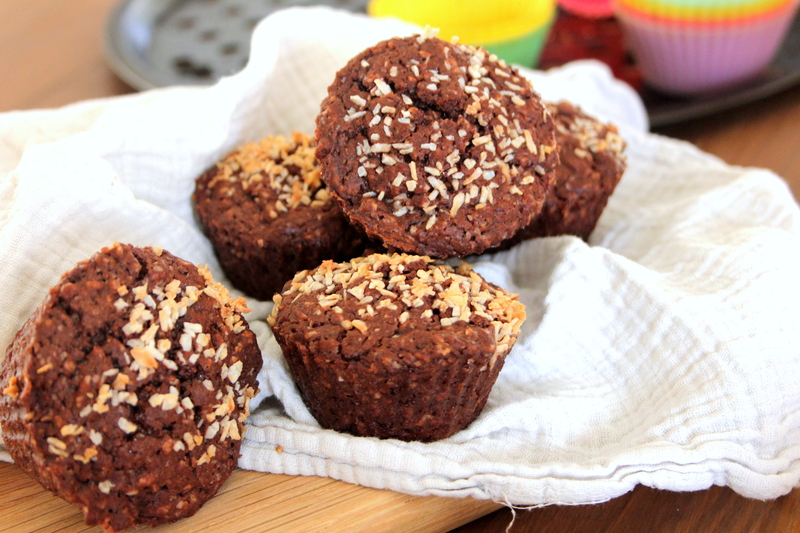 Sprinkle some shredded coconut on top of each muffin. Bake for 25 minutes, or until a skewer comes out clean. What was the best thing about your September? Chocolate and coconut is such a good combo! I meant congrats on the paid job, Clem! Thank you 🙂 It’s a relief to have money in the bank, haha!